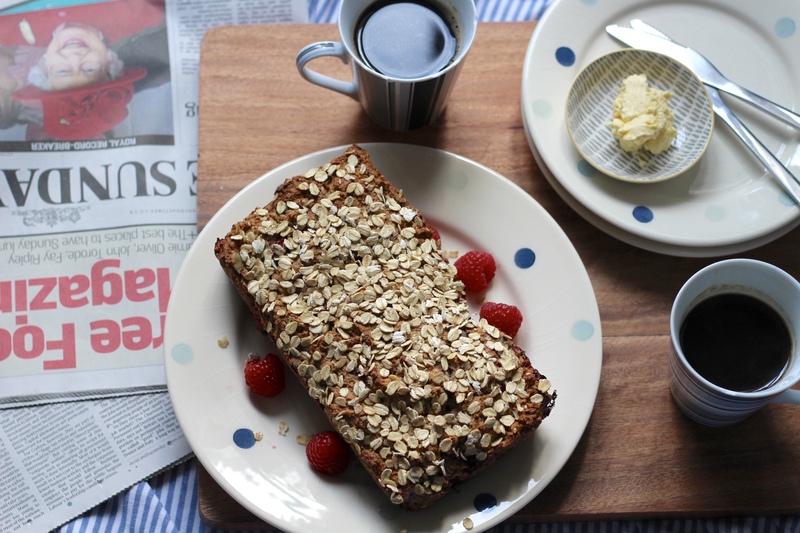 A deliciously fruity, warm bread – ideal for a weekend breakfast in bed on a cold, crisp morning. 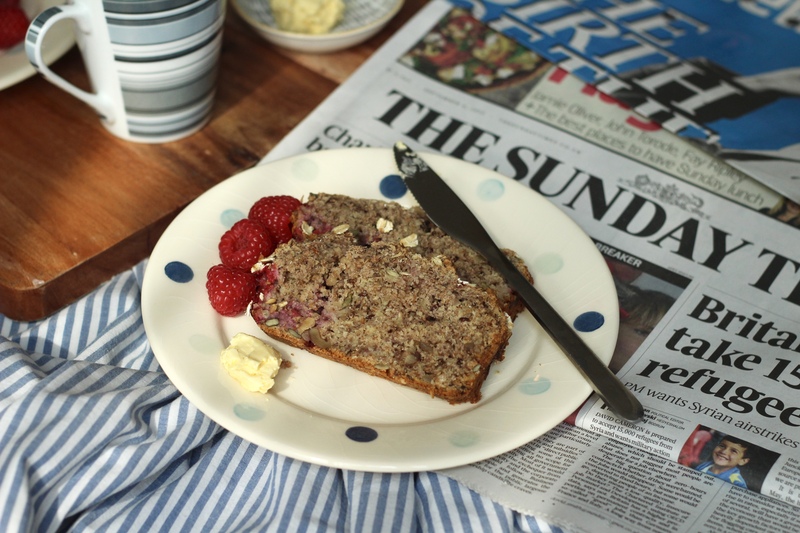 Stuffed with goodness from wholewheat flour, oats, and seeds, it will keep you going all morning long. So we’ve just got back from the most amazing holiday in Australia. It is definitely fair to say that we’re having a big case of the holiday blues… Coming from a wonderfully pleasant 30 degrees, blue skies and sunshine, the endless grey and drizzle back home has certainly been a bit of a shock to the senses! That being said, the trees have exploded with colour all around us whilst we’ve been away, and the leaves on the floor are just begging to be kicked around in childish delight. There are definitely upsides to an autumn at home. Another upside to this part of autumn is that we are in full on autumn/winter food mode. Think stews, casseroles, roast lunches, pies…. the list goes on. I think this bread fits into this category perfectly; warming and cosy, but cheery. 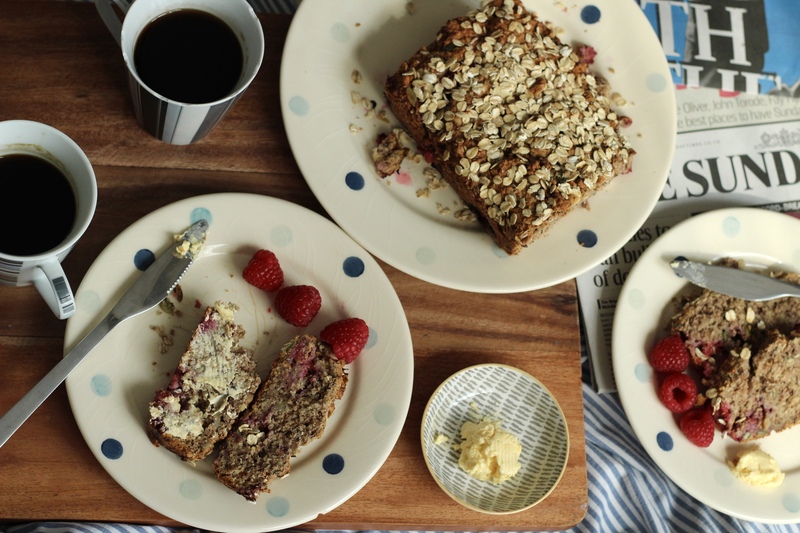 This bread just screams to be eaten in bed – or at least pyjamas. It’s made for a lazy morning, perhaps pouring over the papers in bed with a coffee on a day when there’s no where to be. That’s my kind of weekend day! I’ve used raspberries as per the original recipe – they also happen to be my favourite fruit, so I’ll use them every chance I get – but you could use any kind of berries. I think mixed frozen berries would work particularly well, and they are a lot cheaper than fresh which is always a bonus! I’ve also included a super simple recipe for Honey Butter (think just honey… and butter). Of course you could just spread a little dairy free butter on, but it works brilliantly with the honey and it adds a little touch of luxuriousness . 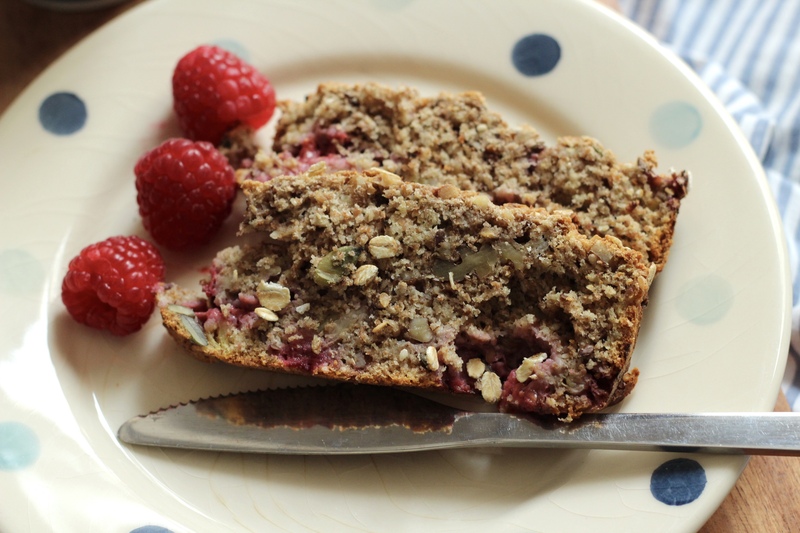 I think it needs a bit of sweetness to combat the wholewheat flour and seeds savoury flavours, and it really helps emphasise the raspberries. Warning: Not for those who don’t like bananas! 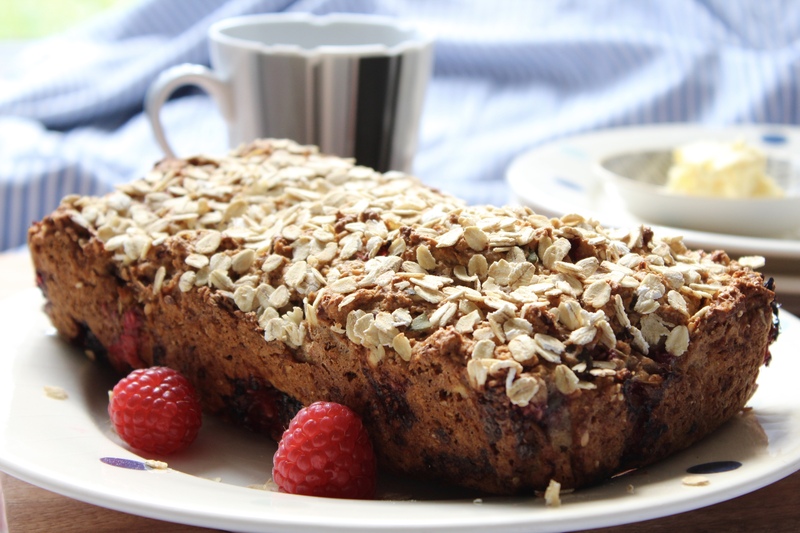 A really simple recipe for Banana Bread, ideal for a breakfast treat or snack any time of the day. A great way to use up any old bananas! Banana Bread is such a good recipe to have up your sleeve. I don’t know about you, but at the end of the week we always have a few bananas left in our fruit bowl, abandoned as the week goes on due to their ever growing brown spots. This recipe is one of my favourites as you have to use old overripe blackened bananas – they have a much stronger banana flavour and of course are much sweeter, which is just perfect for Banana Bread. I much prefer bananas on the green side for eating, so I find this recipe transforms your bin worthy bananas into something utterly delicious; a moist, dense cake where the banana flavour is the star, compliment by crunchy walnuts scattered throughout. As mentioned, the main reason for using old, blackened bananas is the sugar content. The blacker the bananas, the sweeter and more mashable they are, which is ideal for this recipe. The recipe actually has a relatively low added sugar content, because the natural sugars in the banana make up for it big time. If you don’t have ripe enough bananas for this recipe you can cheat and speed up their ageing process by baking them, skin on, in the oven for about 10 minutes until black all over and very squidgey. I’ve made this banana bread very simply, with ingredients you almost certainly have in your cupboard. Unusually for me there are no surprising ingredients, no long list of spices, no twist on a classic. Instead this is as pure a Banana Bread recipe as you can get – the only addition being walnuts (as I think every great Banana Bread has to have texture!). You could use any nuts you like, pecans would also work well. I really enjoyed eating this as a breakfast treat, just cold and thickly sliced. It felt naughty, but everyone needs a treat every now and then… as I seem to tell myself every weekend!